Cambridge staff returned to the picket lines this morning in the third day of strike action over proposed pension changes. Members of the group expressed scepticism about tomorrow’s national-level talks, and also ruled out the possibility of expanding current walkouts to include college teaching strikes. The Sidgwick site – most heavily affected by strikes because of high levels of unionisation within faculties such as English and History, and the departments that collectively teach the HSPS Tripos – was quiet throughout the day, with cancelled lectures and seminars, and an ‘invisible’ picket in place around the site, meaning far fewer students and academics were present. Shortly after midday, most picketing staff headed towards the centre of the city for a rally outside Senate House. After the rally, and before the snowfall, Cambridge UCU held a branch meeting at Great St Mary’s, which is believed to be the largest ever, with almost 100 staff in attendance. In a branch meeting at Great St. Mary’s Church, Cambridge UCU Vice-President Dr. Sam James expressed skepticism of the ability of national talks in reaching a common solution. Acknowledging that the “meeting tomorrow is better than no meeting”, James argued that it was “clear that there will be no movement from employers”. In the wake of disruptions at 57 higher-education institutions across the country last week, 18 university vice-chancellors, including University of Cambridge’s Stephen Toope, have called for renewed negotiations. Representatives for university employers, Universities UK (UUK), and for university staff, the Universities and Colleges Union (UCU), have agreed to resume talks tomorrow. Speaking to Varsity, a PhD candidate in the Department of Sociology described “a degree of optimism” on picket lines after national talks were announced, with picketers viewing the decision as a “sign that the strike is working”. He added, however, that “even though the Minister responsible for Universities said that negotiations should resume without pre-conditions, Universities UK has called for negotiations with a number of pre-conditions”. In a blog post, James urged Cambridge UCU members to “be cautious about the resumption of talks”, as the UUK will be operating under its November valuation of the assets of the University Superannuation Scheme (USS). The UUK stipulates that the November valuation avoids significantly higher employer and employee contributions, as it takes a more moderate approach to risk in closing the scheme’s estimated £6.1 billion deficit. In a tweet on Sunday, universities minister Sam Gyimah also called on universities to “make clear that any money not paid to lecturers – as a consequence of strike action – will go towards student benefit including compensation”. The tweet follows petitions launched by students at institutions across the country demanding remuneration for lost contact hours. The petition for Cambridge students, which calls for £300 reimbursement for every student affected, has reached over 1,000 signatures. At the rally outside Senate House today, Cambridge UCU Secretary Dr Waseem Yaqoob accused the collegiate system at Cambridge of unduly influencing UUK pension proposals. At the branch meeting in Great St Mary’s afterwards, Yaqoob argued that certain colleges’ provision of feedback to UUK reveal a “governance issue” which is “making [the UCU] national officers seriously consider what they can do to bring colleges in if this happens again”. The strikes so far have primarily affected centralised and faculty teaching, with most college teaching remaining undisrupted. 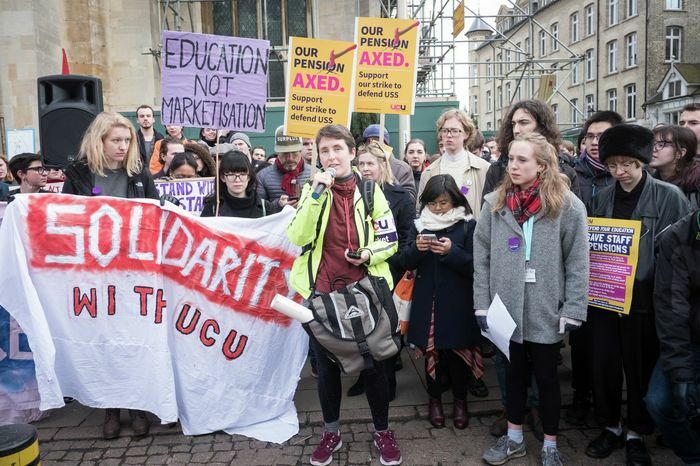 After some members in attendance questioned why they were unable to strike from college work, James and Yaqoob said that teaching and research that occurs within ‘Oxbridge’ colleges is not currently included in the strike action, as they are not encompassed in the UUK’s 136 institutional members and were therefore not balloted for strike action by UCU. The Cambridge UCU branch believes that because some colleges submitted feedback in favour of “a more moderate approach to risk”, they disproportionately influenced the UUK’s proposals. Cambridge vice-chancellor Stephen Toope disputes these allegations. Varsity has not yet received a comment from UUK regarding the extent to which the feedback from institutions operate on a one-employer, one-vote basis, or whether their methodology takes institutional size into account. Cambridge UCU also hosted multiple ‘teach-outs’ today, including a discussion of neoliberalism in higher education and a forum on curriculum decolonisation in collaboration with CUSU. At present, strike action is expected to take place as scheduled, affecting every remaining weekday in Lent term except for 1st March, 2nd March, and 9th March – meaning staff will walk out again for the next two days.